How to be a Piping Specialist? Factories and plants ranging from petrochemical, chemical, process, power, pharmaceutical, and food plants utilize piping networks in their daily operation. Being a key component, it is essential that the integrity of the piping systems is well designed and maintained. In the final quarter of 2018, we introduce three courses for engineers and companies to strike a balance between production, cost, and safety when it comes to the piping system. Piping Design & Arrangement is designed for those who would like to know more about piping fundamentals such as piping components, international standards, materials, drawings from different stages of a piping project, drawings and terminology, and the concept involved in their creation related to design and layout of the piping system. Piping Flexibility & Stress Analysis is designed to provide a thorough understanding of the of the concepts behind process piping stress & flexibility analysis in relations to ASME B31.3 code. ASME B31.3 Process Piping provides a comprehensive coverage of the process piping code requirement for the design, construction, and integrity of the process piping system as per ASME B31.3 standards. 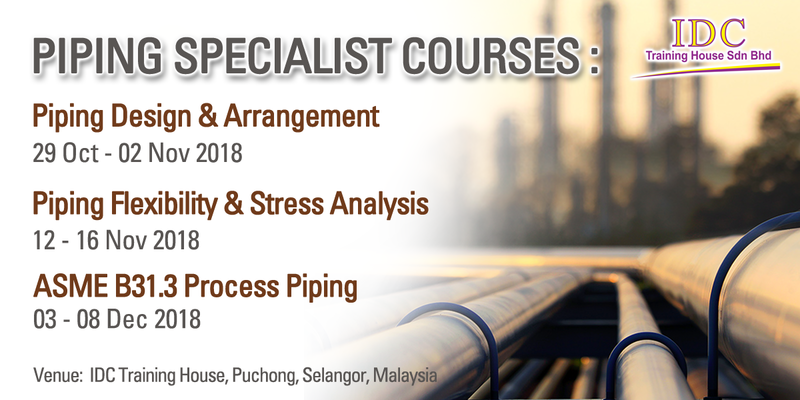 This course is specifically catered to those who would like to be an ASME code professional relating to design, analysis, fabrication, erection, and testing of the process piping system.